Mental health is no longer a taboo topic in much of society, but for many minorities, the stigma is still strong and prominent. July is Minority Mental Health Awareness Month to help those affected by mental health conditions get the treatment they need and begin to erase the stigma through education and awareness. In general, people are talking about mental health much more than they ever did before. Advertisements for drugs to treat depression and bipolar disorder are common; celebrities openly discuss their mental health challenges; and support groups are often well attended across the country. 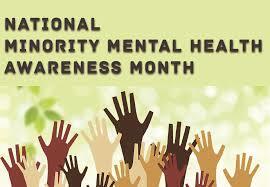 But for minority groups, the stigma of mental health struggles is often present. While some groups in the country feel freer to make their challenges known, minorities often struggle with mental health in silence. Afraid to bring their symptoms to light, they often don’t get the treatment that could help them feel better and make their lives easier. As nurses know, mental health is a physical condition. It might be called mental health because it affects the brain, but anyone with a mental health disorder is struggling with a physiological disease. But because the topic has been taboo for so many for so long, the freedom to be honest about their disease remains elusive. According to the American Psychological Association, minorities have additional roadblocks. Even if they are ready to get help, they often lack access to high-quality mental health care and treatment. There might not be enough providers or those providers might be hundreds of miles away. Providers who take insurance might be hard to find and those who offer culturally competent care might be even more sparse. Speaking with a provider who isn’t aware of the cultural stigmas against minority mental health issues in a specific community could make the patient feel even more isolated. You can learn more about the barriers to adequate care in your own community and begin to seek out solutions. Finding a few culturally competent providers, keeping a list of online resources, and referring patients to trusted specialists if they are available can be a big help as can keeping a compassionate and factual approach to patients who are struggling with symptoms and with stigma. If they are treatment resistant, you still have a powerful tool in voicing that mental health is a imbalance of brain chemicals, is not their fault, and that help is available. Being an open ear can also help someone who is having a tough time but is reluctant to get help. Urge them to get relief, offer helpful resources, educate them to dispel myths they may be holding, and work with your team to raise awareness and ensure no unconscious bias exists.